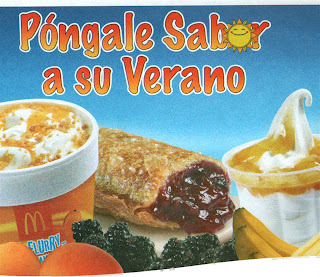 Thread: McDonald's "Summer is in the air"/McDonalds "Llegó el verano"
McDonald's in Managua, Nicaragua (nearMetroCentro) has summer fever. That crazy clown has added three new delicious items to the menu: Mango McFlurry's, raspberry pies and banana sundaes. Umm umm!!! They go for C$31 ($1.45), C$23 ($1.05) and C$21 ($1.00) respectively. Run and get them before rainy season! En Managua, Nicaragua, McDonald's (por MetroCentro) tiene fiebre de verano. Aquel payaso loco ha agregado tres deliciosas opciones al menú: McFlurry de mango, pay de mora y sundae de banano. Umm umm!!! ¿Cuanto cuestan? C$31 ($1.45), C$23 ($1.05) y C$21 ($1.00) respetivamente. Corré y alcanzá algo antes que llegue la lluvia! 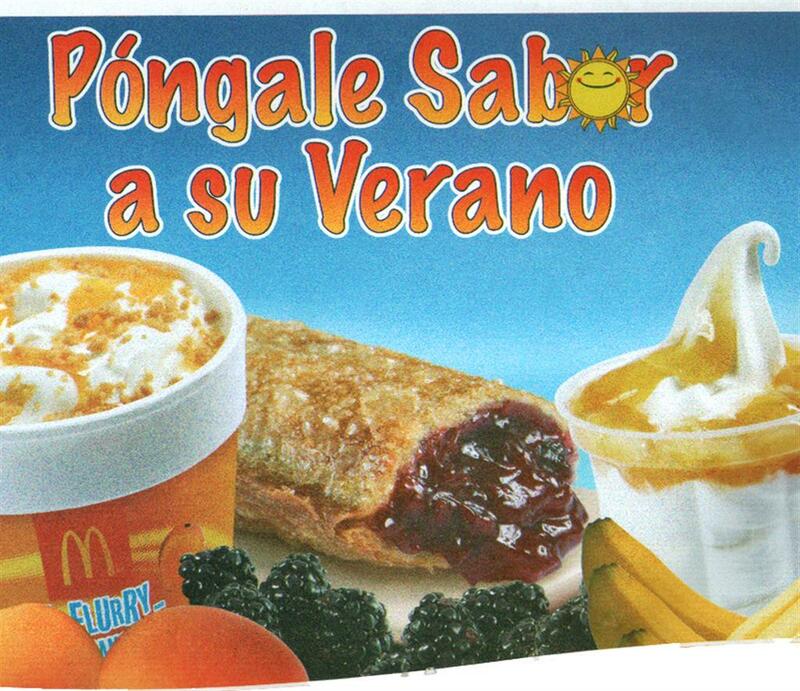 Re: McDonald's "Summer is in the air"/McDonalds "Llegó el verano"
Jamie Oliver did a show where he was trying to get American school kids to stop eating McNuggets. He showed them a whole chicken. Then he cut out the breast meat, wings, and thighs. He showed them the remaining carcass and said, "Would you want to eat that?" They all went, "Eeew!" "That's what chicken nuggets are made of," he told them. Then he chopped up the carcass and put it in a blender. The liquefied carcass, he poured into small molds and asked again if they'd eat it. "No!!!!" the all said. When the stuff had congealed he threw them into a fryer. He took out the golden brown "chicken" and asked one more time if they'd eat it. "Yeah!" they all said. He was dumbfounded, as that demonstration always worked on kids in England. Puree of chicken bone, cartilage, and random soft tissue certainly isn't poisonous, but it doesn't make for a balanced diet either! He'd gone to some little town in W. Virginia that had been designated the most overweight city in the most overweight country in the world. The fattest of the fat. He spent a week in a school cafeteria trying to prepare decent meals, and meeting bureaucratic resistance from the staff and school board. The school was feeding the kids pizza for breakfast. In one classroom, not one single kid could name any of the vegetables he held up. They'd never been exposed to anything but factory-made meals. He also spent time with one family at home, who were all pre-diabetic gut buckets, getting them to stop eating factory-made food. He had limited success. Well on a 1/2 segue here... is a bit aired on the CBC last Sunday.. It is where the the Mickey D's in Karachi Pakistan has become something like a park where families come to play and talk and meet without worrying about guns, kidnappings and bombings. You do have to pass security, but do not have to buy anything ... A really interesting listen.. When Capt. Kenny Land entered the house, He said, Who $hit?